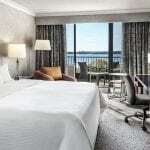 Perched on the vibrant waterfront of Lake Ontario, the Westin Harbour Castle Toronto is a shining example of the Westin brand’s dedication to traditional luxury and customized service. This eco-friendly hotel is filled with amenities to create an experience that both the business and leisure traveler will not soon forget. From recreation to dining, the Westin Harbour Castle Toronto is one of downtown Toronto’s most impressive luxury hotels.